It’s quite common to lose a smartphone these days. But getting it back can prove really difficult. Keeping these things in mind, Microsoft has taken necessary precautions to keep your Windows Phone safe and secure in case you happen to lose it. 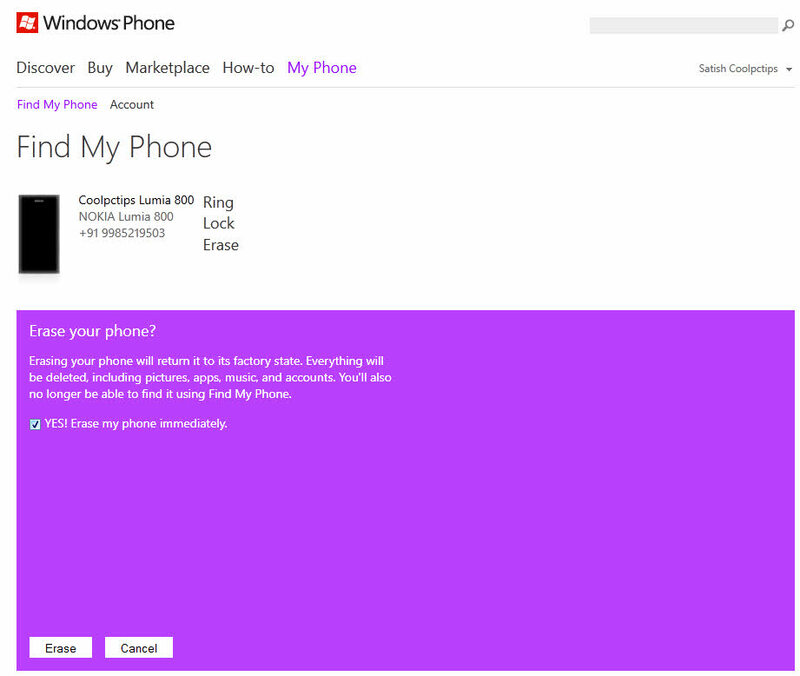 Say hello to Find My Phone, this amazing feature allows users to find their lost Windows Phone. The user can instantly lock and erase the phone within 2 seconds. Also you can call your phone, so that you can find it if you have lost it somewhere under your bed or sofa. This is a free service provided by Microsoft, to keep their users data secured. 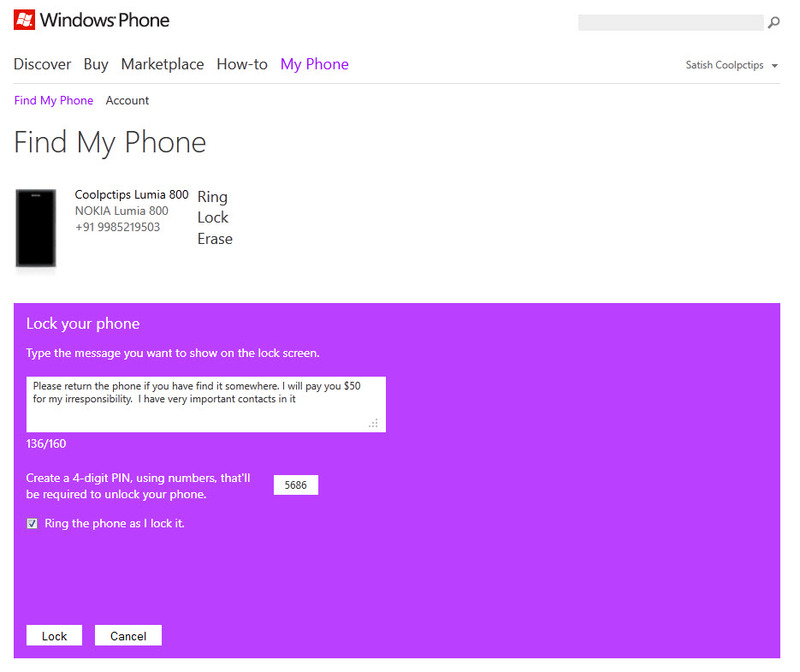 You can also see your phone location by just logging into the Windows Phone official website. In this article, we will show you how to protect your Windhows from theft, and prevent someone from using the phone without your permission. Since we never knew when or how we might lose our phones, it’s better to protect it right now. You can check out the steps below to call, lock and erase your Windows Phone. The first thing you have to keep in mind is, Your Windows Phone should always be connected to windowsphone.com. To do this, you have to just go to Settings -> find my phone and check the box which says, connect to these features faster. This will keep your phone always connected to the official website of Windows Phone. Now lets find out how we can ring, lock and erase your phone. Just follow the simple steps given below. Step 1: Login to windowsphone.com with the same email ID which you use in your Windows Phone. Step 2: If you are logging in for the first time, you will be asked to enter your phone number, email address, trusted PC and security question. Once you have entered the right information, click on Save. (You can add more than one contact information). Step 3: Go the upper navigation bar and click on My Phone -> Find my phone. You should see your windows phone connected already. Make sure all the information which is present there is correct. If not, you can modify it any time. Step 4: Click on Ring option to make a call to your mobile phone. Note that the ring will be a alert sound with complete vibration. You cannot stop the ring unless you switch off the phone and restart it (personal experience). Step 5: Now click on Lock your phone, just click on Lock option and then enter the following information shown below. You can enter a message and a pin number, so that your screen will be locked. Later, you can unlock your phone with that pin number, and use it as usual. Check out the screen shot for more info. Step 6: Erase, make sure you are completely conscious when you click this option. Once you have clicked on erase, the whole data will be deleted automatically. If you have lost your windows phone, and want to trace the address, then just log into your Windows Phone account via official Windows site. You can find a map which shows the exact location of the mobile. You can take a print of that mobile and ring the phone until its returned back or switched off. In case if your windows phone is stolen, you can use the lock or erase option to keep your data secured. If you have any queries on how to find your Windows Phone, please leave a comment below. Another reason to buy Windows Phone, simply awesome and thanks for posting this informative article. what if the theif has flashed the phone.. i knw it will take some time to do that, till then we can log in and find the location… but what abt this flasing problem? If it’s flashed nothing can be done. I’m planning to buy Windows Phone, thanks for sharing such a nice tips I will make sure to follow this tutorial if in case I lost my phone in future.